[159 Pages] The beneficial insects (macrobials) market is estimated to be valued at USD 481.4 Million in 2017, and projected to reach USD 788.0 Million by 2022, at a CAGR of 10.4%. With the increase in demand for food security for the growing population, along with the limited agricultural land available in the world, rise in crop loss due to various pest problems, and increased demand for organic food products, the use of beneficial insects (macrobials) is expected to enhance market growth. The beneficial insects (macrobials) market is segmented on the basis of type and application. It is further segmented on the basis of region into North America, Europe, Asia-Pacific, Latin America, and Rest of the World (RoW). The main objectives of the report are to define, segment, and project the market size of the beneficial insects (macrobials) market with respect to the above-mentioned segmentations and provide a detailed study of key factors influencing the growth of the market along with profiling the key players in the market and their core competencies. This report includes estimations of market sizes for value (USD million) with the base year as 2016, and forecast period from 2017 to 2022. Top-down and bottom-up approaches have been used to estimate and validate the size of the beneficial insects (macrobials) market and to estimate the size of various other dependent submarkets. 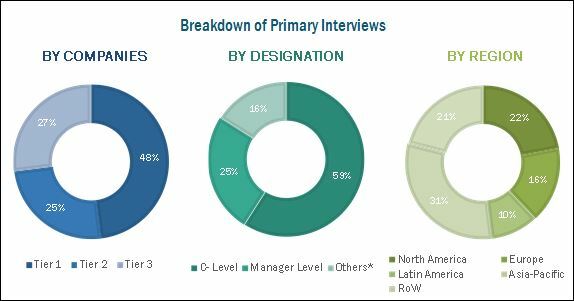 Key players in the market have been identified through secondary research, and their market share in respective regions has been determined through primary and secondary research processes. All percentage shares, splits, and breakdowns have been determined using secondary sources and were verified through primary sources. This study estimates the global market of beneficial insects (macrobials), in terms of USD, through 2022. It offers a detailed qualitative and quantitative analysis of this market with reference to the competitive landscape, and the preferred development strategies such as agreements, expansions, mergers, and acquisitions to gain a larger share in the market. It provides a comprehensive review of major market drivers, restraints, opportunities, challenges, winning imperatives, and key issues of the market. It covers various important aspects of the market. These include analysis of the value chain, competitive landscape, market dynamics, market estimates in terms of value, and future trends in the beneficial insects (macrobials) Market. The beneficial insects (macrobials) market is projected to grow at a CAGR of 10.4% to reach USD 788.0 Million by 2022. The market growth is driven by the rising demand for organic food, need for food security for the growing population, advancement in farming practices and technologies, and heavy crop loss due to pest problems. The market is further driven by factors such as increasing demand for pest-specific bio control agents, along with increasing acceptance for Integrated Pest Management (IPM) by the farmers, and high opportunities in developing countries. On the basis of type, the beneficial insects (macrobials) market is led by predators, followed by parasitoids and pollinators. The predators lead the market as they destroy and feed upon many preys (pest/insects) during their lifetime or during their development. They capture and eat other organisms such as insects or mites. Predators include ladybird beetles, ground beetles, lacewings, syrphid (hover) flies, aphid midges (Aphidoletes), and yellowjacket wasps. Parasitoids are insects that parasitize other insects. The immature stages of parasitoids develop on or within its host, eventually killing it. Parasitoids may attack all life stages of their host. The beneficial insects (macrobials) can be used in both crop protection as well as crop production; however, it is mostly used in crop protection from harmful pests. Crop protection application is projected to grow at the higher CAGR during the forecast period. The demand is driven by factor such as ecofriendly nature of microbial pesticides and increasing demand for organic food products. In 2016, in terms of volume, North America accounted for the largest market share in beneficial insects (macrobials) market, followed by Europe and Asia-Pacific. Increasing awareness about the benefits of organic products among the consumers, adoption of IPM practices, advancement in farming technology, and increase in environmental concerns is leading to the growth of the market in this region. 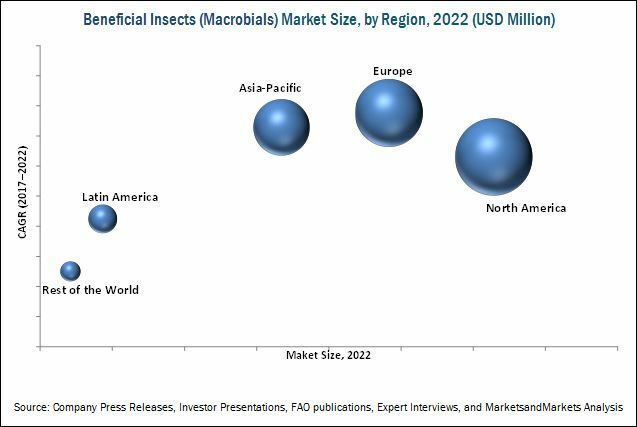 The beneficial insects (macrobials) market in the Asia-Pacific region is projected to grow, with investments from several multinational manufacturers. Moreover, extensive R&D initiatives have been undertaken for exploring the new varieties of beneficial insects and their effective control methods. Factors such as short shelf life and labor-intensive usage & requirement of professional training act as restraints to the market. Key players identified in the global beneficial insects (macrobials) market include Dudutech Ltd. (Kenya), Koppert BV (Netherlands), BioBest NV (U.S.), Applied Bio-Nomics Ltd. (Canada), and Bioline AgroSciences Ltd. (U.K.). Most key participants have been exploring new regions through new product launches, collaborations, and acquisitions across the globe to avail a competitive advantage through combined synergies. Since 2011, the beneficial insects (macrobials) market has witnessed an increase in demand as a result of increased demand for organic products, especially in countries such as the U.S., Canada, Spain, and the U.K.
11.7 Biobee Biological Systems Ltd.